As adjuncts to our highly popular “America’s Greatest Hits” series of collections for each calendar year in the 50s and early ‘60s, we have already produced collections based on landmark moments in the Billboard charts – “The First Top 100 Nov. 1955” (ACQCD7062), “The First Hot 100 Aug. 1958” (ACQCD7083) and “The First Hot 100 of the '60s” (ACQCD7097), each comprising all the records in the Top 100 for the date in question. 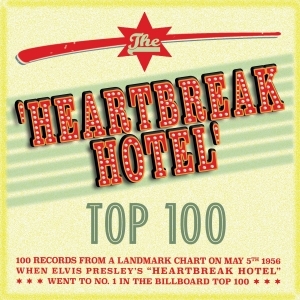 This collection highlights another musical landmark with the Top 100 on the date when Elvis Presley’s “Heartbreak Hotel” went to No. 1 in the first week of May in 1956. Although, contrary to popular wisdom, the advent of rock ‘n’ roll was much more of a musical progression than an explosion, the arrival of The King at the top of the charts was somehow an especially significant and iconic moment, which marked something of a watershed between the established order of the early ‘50s and the changing musical, social and political landscape of subsequent years. It comprises 100 records from the Billboard chart of May 5th 1956, from Elvis at No. 1 to Peggy Lee’s “Joey, Joey, Joey” at No. 100, and as those two records imply, the chart encompasses strands of music of all kinds as the rock ‘n’ roll pioneers jostle for position with the crooners, divas, vocal groups and orchestras who had held sway for so long. It’s a fascinating snapshot of a time when the music business and popular tastes were in transition, and every week there was something new to excite the baby-boomers. Alongside the major names there some obscure and often collectable records – minor one-hit wonders on relatively unknown labels which are not generally available on CD and which give a fascinating insight into the music of the time. It contains a 12,000+ word booklet featuring background notes on every record. 15 Moonglow & Theme From Picnic George Cates Orch. 16 Main Title ("Man With The Golden Arm") Richard Maltby Orch. 5 Main Title ("Man With The Golden Arm") Les Elgart & His Orch. 10 Eleventh Hour Melody Lou Busch & His Orch. 20 Main Title ("Man With The Golden Arm") Buddy Morrow & His Orch.